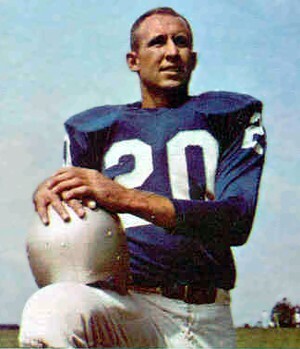 A star on Auburn’s 1957 national championship team, Atkins was chosen by the San Francisco 49ers in the fifth round of the ’58 NFL draft. He saw some action as a punter and in the defensive backfield in two seasons with the 49ers before moving to Buffalo of the new AFL in 1960, where he averaged 39.0 yards on a league-leading 89 punts and intercepted five passes while starting at cornerback. He was also used as a placekicker and was successful on 6 of 13 field goal attempts. Atkins was shifted to safety in 1961 as personnel was juggled in the defensive backfield. Bills went 6-8 to finish fourth in the AFL Eastern Division. Seeking an upgrade at quarterback, the Bills traded Atkins to the New York Titans for veteran QB Al Dorow prior to the 1962 season. He intercepted four passes and was leading the league with a 44.0 punting average when he went down with a knee injury at midseason. Atkins saw little action with the Jets and Buffalo in ’63 and, after a three-game stint with Denver in 1964 his career came to an end. Overall, he intercepted 20 passes (19 of them in the AFL) and averaged 41.6 yards on 221 punts. Atkins went on to become head coach at Troy State and guided the school to the NAIA national championship in 1968. He was a 2005 inductee into the Alabama Sports Hall of Fame.